The Earth’s atmosphere, its climate, weather and lifeforms are all dominated by the presence of liquid water. The first oceans formed at least 4 billion years ago which is “only” some 500 million years after the Earth itself. That means that for over 4 billion years temperatures have never risen enough to boil off all the surface water. How did this happen ? The IPCC predictions of a human-induced 2-7 degreesC rise by 2100 are all based on the premise that a small rise in temperature due to CO2 is then amplified through positive feedbacks due to more evaporation from the oceans. All scientists agree that a doubling of CO2 concentrations alone would lead to a rather modest 1 degreeC rise in temperature. Even a 4 fold increase in CO2 would lead to just a 2 degreeC rise. 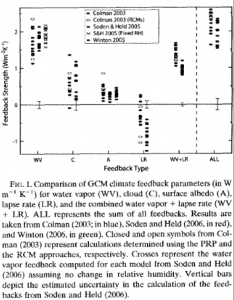 It is only by assuming a positive feedback from water that IPCC modelers achieve large temperature rises. They assume that as temperatures rise the atmosphere will hold constant the relative humidity inferring that the atmosphere will hold more total water vapour leading to an enhanced greenhouse effect . In addition most models adopt particular cloud models that then additionally result in a positive feedback (see Figure 1. above). Changes in cloud cover is the most uncertain variable for models and this is also recognised by the IPCC. Boundary layer clouds are known to have a strong negative feedback in the tropics nd low level clouds reflect sunlight and have a net cooling effect on climate. Some very respected scientists believe that the IPCC is just simply wrong and the overall feedback from water (clouds and humidity) is likely negative . If it turns out that the actual effect of water in the oceans is to stabilise temperatures through negative feedback then the whole edifice of AGW collapses. It appears to me that the presence of liquid water on the Earth for billions of years, surviving multiple massive meteor impacts, super-volcanoes and changes in solar radiance of ~ 30% etc. strongly suggests that the oceans must indeed stabilise Earth’s temperatures. There are two other facts about the Earth which I believe cannot be just pure coincidence. 1. The Earth is unique in our solar system, and all other planets discovered so far, in having liquid water on its surface. I find it remarkable that given this fact – either the whole surface should be covered by water or else just tiny isolated regions. Instead we have a balance with 70% water cover (even at the equator) with one oceanic crust and 30% land with a different continental crust. The continents then drift around due to internal heat convection in the magma but they appear to remain roughly 30% of the surface over billions of years. The continents are made of much thicker granite rocks floating higher in the magma whereas the oceanic crust is made of thinner basalt rocks. Why are they so different ? How come there is this anisotropy in the Earth’s crust which more or less defines the proportions of oceans and land ? After the recent proposal that a similar asymmetry in the moon’s surface between the visible and side and the dark side of the moon was caused by a slow collision between our moon and a smaller second moon some 4 billion years ago, I began to wonder if perhaps the same explanation could explain the different in chemical makeup of the continents and the oceanic crust. Could such a slow collision between a large planetesimal and the Earth in the distant past implant a pancake of granite onto the young Earth’s surface ? This would then presumably led to a primeval Pangea. 2. The Earth’s surface is 66% Ocean, 29% land with 5% inland lakes, so roughly 70% of the Earth’s surface is liquid water. Satellite measurements of cloud cover have for nearly 30 years show that the global average cloud cover is about 67%. This is nearly exactly the same as the Ocean surface %. I find this a remarkable fact which must be saying something profound about the natural balances at work in the Earth’s climate. Every square meter of open Ocean seems to be balanced by a square meter of cloud cover somewhere in the atmosphere. The Ocean surface cools through evaporation and radiation. Using the figures from Kieht & Trenbeth 116.5 watts/m2 is lost by evaporation from the ocean surface which is about 30% of the radiation loss. Water vapour rising from the surface eventually condenses in the upper atmosphere warming the air to form clouds. It works rather like a refrigerator transferring heat directly from the ocean surface up to the troposphere. From here the warmed upper atmosphere eventually can then radiate out to space. Note that this energy transfer from the ocean surface to heights of 1000 – 5000m is independent of increases in CO2 levels below the condensation point. Water vapor is the strongest greenhouse gas providing up to 90% of the Earth’s greenhouse effect. If all CO2 was removed from the atmosphere the temperature would be about 3 degrees colder. Removing all water from the planet then the temperature would plunge by ~ 30 degrees. The Oceans must have stabilised Earth’s temperatures for up to 4 billion years when liquid water first appeared. During that time the Sun’s output has grown by 30% but temperatures have not changed dramatically. 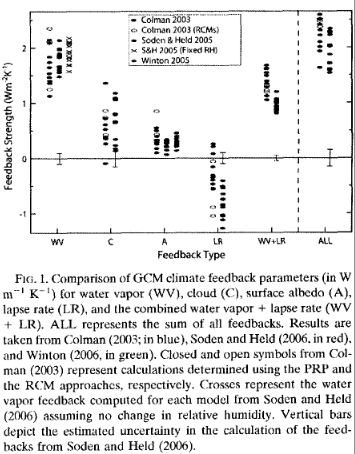 IPCC models all assume a large positive feedback from water vapour AND a positive feedback from clouds. This results in far larger temperature rises of between 2-5 degrees than the modest 1 degree rise expected just by a doubling of CO2. Low level clouds have a net cooling effect on the Earth’s surface because they reflect solar energy as anyone on a beach in the UK in August can testify. They trap somewhat infrared radiation at night but the net effect is cooling. So what is actually hapenning ? Here I am more or less following a similar analysis as that described on climate4you , which is run by Prof. Humlum at University of Oslo. The ISCCP  have been measuring cloud cover from space for nearly 30 years. 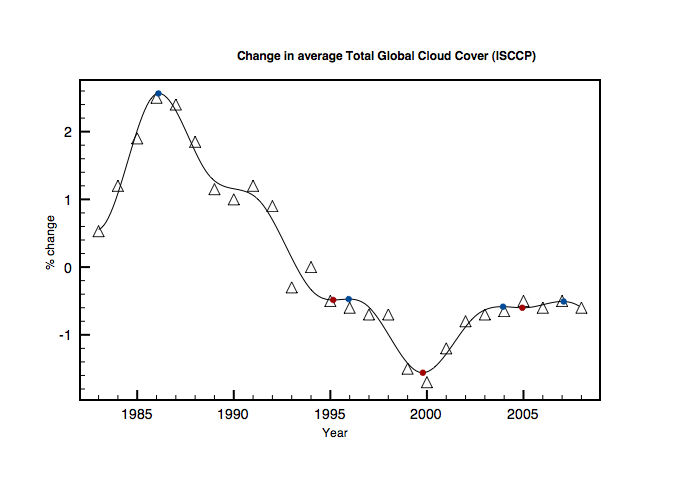 The data can be accessed at http://isccp.giss.nasa.gov/index.html The change in average yearly global cloud cover since 1983 is shown below. There are evident year to year changes of the order of 1% in average cloud cover from the mean of ~ 66.5%. 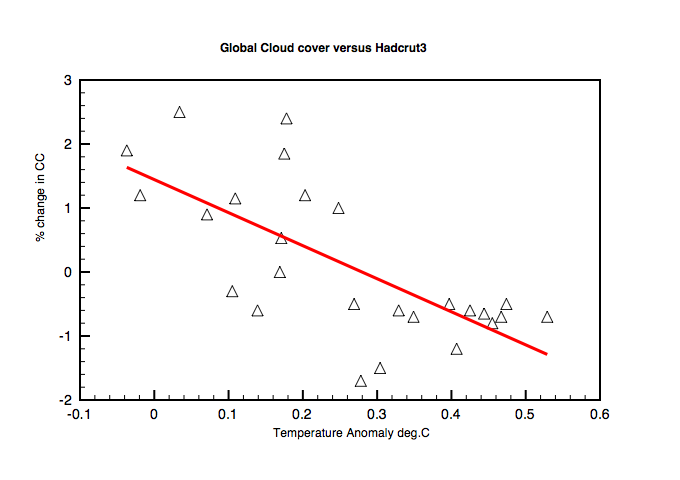 We can see whether this change is correlated to temperature by plotting cloud cover against global annual temperatures (Hadcrut3) as shown in figure 3. Fig 3: Change in cloud cover versus temperature and a linear fit. There is indeed evidence of an anti-correlation with temperature showing a slight decrease in cloud cover with higher temperatures. One might expect the opposite if higher temperatures lead to more evaporation. However, it is not possible to say whether changes in cloud cover are a cause of or a response to small temperature increases. Relative humidity data is available from the Earth System Research Laboratory, NOAA . Following climate4you we use global averaged data from ESRL at 3 pressure levels – Surface (1000mb), 3km(600mb) and 9km(300mb). The data cover a 60 year period and are shown in Figure 4. 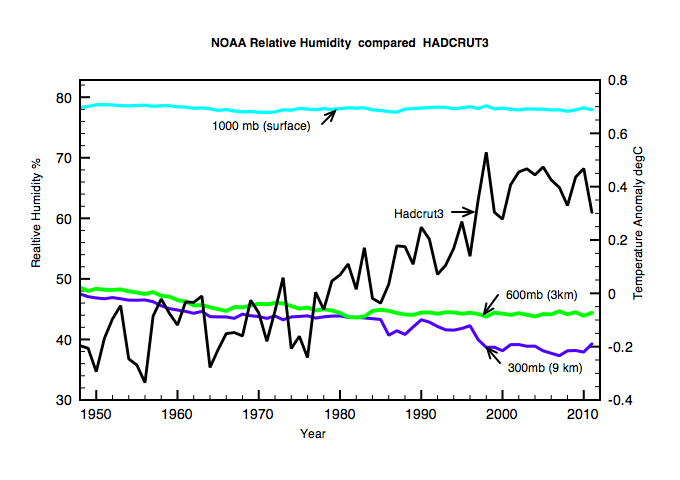 The relative humidity at the surface remains constant but we see a clear decrease in humidity at a height of about 3 km and an even stronger decrease at 9km. This is the opposite of what you would expect if there was a positive feedback from the greenhouse component of water vapour. 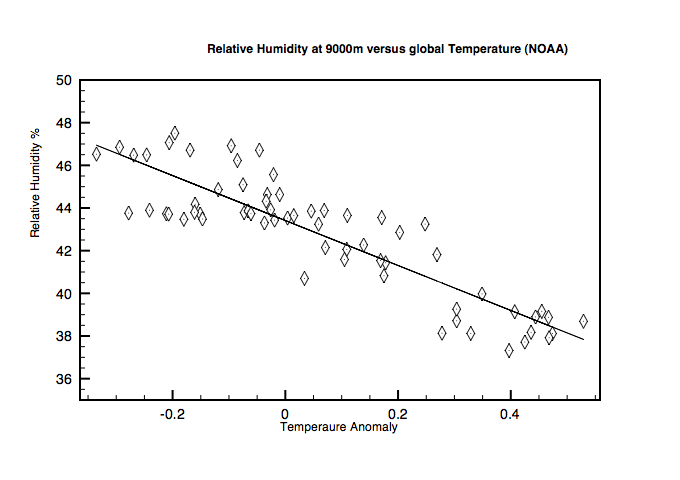 This effect can be seen by plotting relative humidity for the 600mb level versus global temperatures as shown in Fig 5. The linear fit to the data would shows a clear fall of about 10% in relative humidity at a height of 9km for a surface temperature rise of 1 degreeC. All other things being equal (lapse rate etc. ), less water vapor means less greenhouse effect which implies to me that the feedback from water vapor could well be negative. 1. Cloud cover depends on temperature. The linear fit to global cloud cover versus temperature implies that an increase in cloud cover of 1% leads to reduction in temperature of about 0.15 degreesC. 2. Relative humidity has remained constant at the surface over the last 30 years but has reduced in the upper troposphere. There has been a significant drop in relative humidity at the top of the troposphere ( 9 km ) which implies that the green house effect alone from water vapor has reduced during observed warming since 1948. The usual disclaimers apply. I don’t claim to be a climate scientist but I believe any theory must stand or fall based on observation. I welcome criticism and corrections for any errors present above. I have the strong feeling however that the Oceans must be responsible for stabilizing the Earth’s climate over billions of years despite huge astronomic and natural disruptions to the Earth’s energy balance in the meantime. Evidence is growing that climate sensitivity is less than predicted by IPCC and in particular that the overall feedback from water vapor and clouds is small or even negative. This entry was posted in Climate Change, Physics and tagged Climate Change, CO2, H2O. Bookmark the permalink.